An oxygen sensor (O2 sensor) measures the amount of oxygen in the exhaust gases, sending the signal to the engine computer. 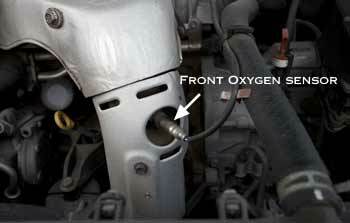 A front oxygen sensor is installed in the exhaust manifold or in the front exhaust pipe before the catalytic converter. As you know, a catalytic converter is a major part of the vehicle's emission control system. A rear oxygen sensor is mounted in the exhaust after the catalytic converter. 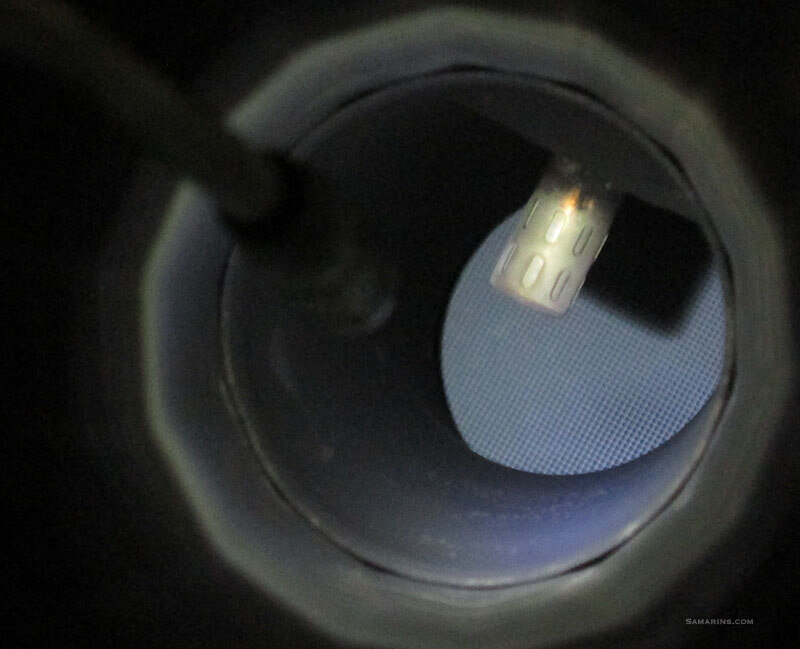 See the photo showing how the rear oxygen sensor looks inside the exhaust. Cars with a 4-cylinder engine have at least two oxygen sensors; V6 and V8 vehicles have at least four O2 sensors. The engine computer (Powertrain Control Module, or PCM) uses the signal from the front oxygen sensor to adjust the air/fuel ratio by adding or subtracting fuel. 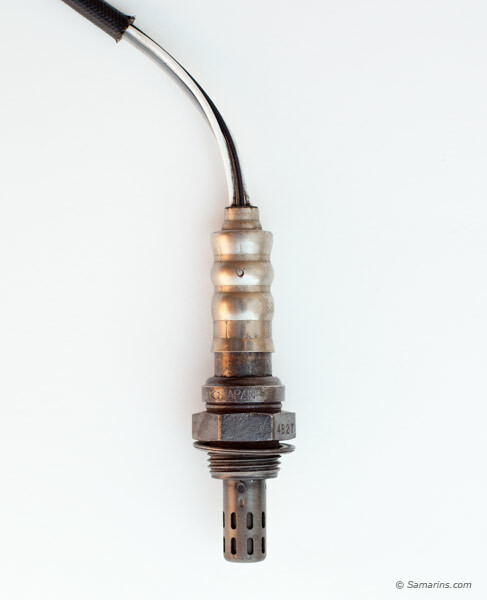 The rear oxygen sensor signal is used to monitor the performance of the catalytic converter. In modern cars, an air fuel ratio sensor is used instead of front oxygen sensor. It works similarly but is more precise. Read about it in this article: air fuel ratio sensor. There are a few types of oxygen sensors, but to keep it simple, in this article, we will only consider conventional voltage-generating oxygen sensors. As the name implies, a voltage-generating oxygen sensor generates a small voltage proportional to the difference in the amount of oxygen inside and outside of the exhaust. When the air-fuel mixture entering the engine is lean (less fuel and more air), there is more oxygen in the exhaust and the oxygen sensor will generate a very small voltage (0.1 - 0.2V). If the air-fuel mixture becomes rich (more fuel and less air), there is less oxygen in the exhaust, so the oxygen sensor will generate more voltage (around 0.9V). 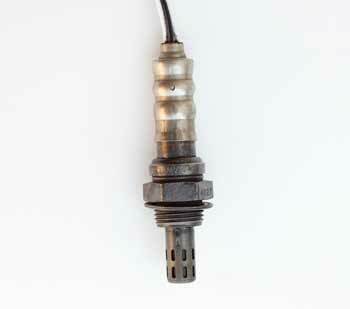 To work properly, an oxygen sensor must be heated to a certain temperature. A typical modern sensor has an internal electric heating element that is powered by the PCM. A front O2 sensor is responsible for keeping the air/fuel ratio of the mixture entering the engine at the optimal level, which is approximately 14.7:1 or 14.7 parts of air to 1 part of fuel. When the front O2 sensor senses high level of oxygen, the PCM assumes that the engine is running lean (not enough fuel), so the PCM adds fuel. When the level of oxygen in the exhaust becomes low, the PCM assumes that the engine is running rich (too much fuel) and reduces fuel supply. This process is continuous. The engine computer constantly cycles between slightly lean and slightly rich conditions to keep the air/fuel ratio at the optimum level. This process is called closed loop operation. 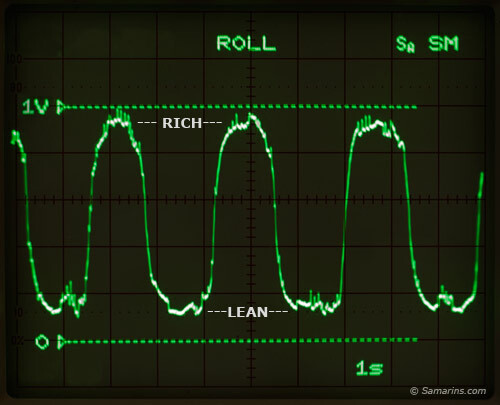 If you look at the front oxygen sensor voltage signal (see the scope signal above), it will be cycling somewhere between 0.2 Volts (Lean) and 0.9 Volts (Rich). See the photo. When the car is started cold, the front oxygen sensor is not fully warmed up, and the PCM does not use the front O2 sensor signal for fuel trim adjustment. This mode is called an open loop. Only when the oxygen sensor is fully warmed up, the fuel injection system goes into the closed loop mode. Modern cars have a broadband air/fuel ratio sensor installed instead of a regular oxygen sensor. An air/fuel ratio sensor works differently, but serves the same purpose - to detect whether the air/fuel mixture entering the engine is rich or lean. An air-fuel ratio sensor is more precise and can measure wider range of air/fuel ratio. Read about rear oxygen sensor, sensor identification and replacement on the next page. Crankshaft position sensor: how it works, problems, testing.